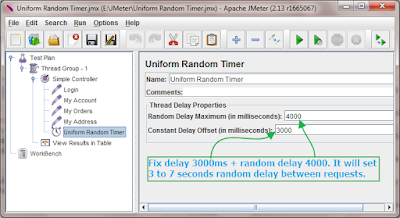 Earlier we learnt whats is the main concept of uniform random timer, usage of it's different parameters and how to add it in your software load test plan. 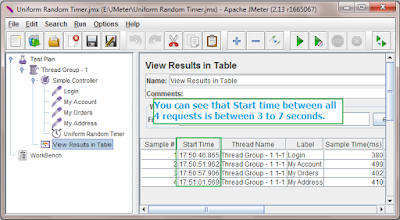 Now here we will see how to add uniform random timer parallel to requests of your software load test plan and how it will works. Let's see with example. Scenario : I have a software load test plan with 4 different requests. I wants to put random delay of 3 to 7 seconds between all 4 requests of my test plan. 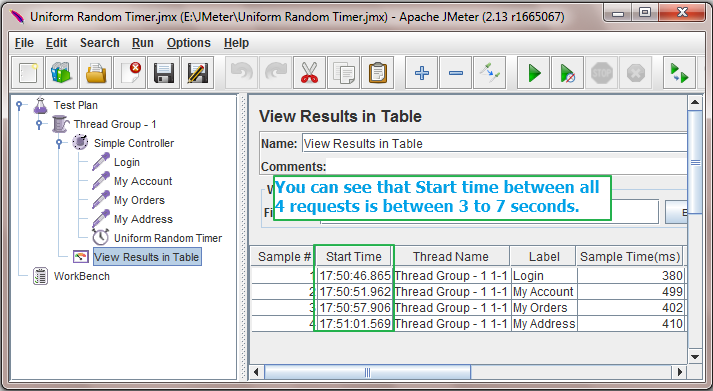 So i will add uniform random timer parallel to requests as shown in bellow image. So it will set random delay of 3 to 7 seconds between all 4 requests of my software load test plan. Let's run it and view result in table. My result is looks like bellow. You can see that delay between start time of all 4 requests is between 3 to 7 seconds. Example : Start time of "Login" request is 17:50:46.865 and start time of "My Account" request is 17:50:51.962. This difference is 5.097 seconds. Same thing applied for all requests. 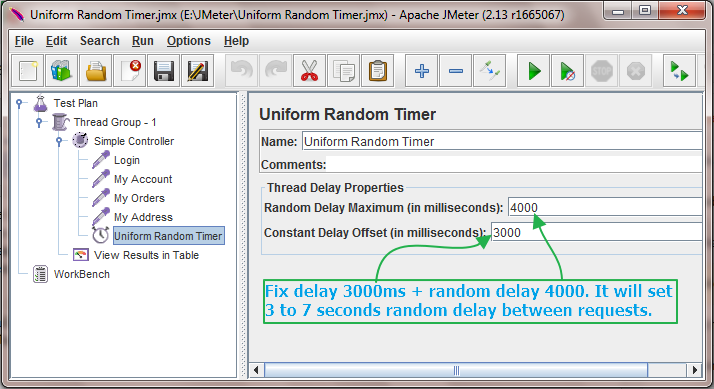 This way you can use uniform random timer parallel to requests of your software load test plan to apply delay to all the requests.